Fixed QR codes being hard to read by some apps. Removed unused CheatTerminal_HC_ScaleDamage script fragment from the GameAlterSurvivalManipulation script. Added Game Alterations -> World Manipulation -> Teleport Merchants -> Unique settlement merchants. Fixed various spelling and grammatical errors. Added Quest -> Fix Quests. Fractured Game Alterations -> Survival Manipulation -> Modify Incoming/Outgoing Damage in to two separate features. Added feedback for the user when spawning Workbenches. Refactored Infinite Companion Ammo to be more efficient. Added Game Alterations -> Survival Manipulation. Added Game Alterations -> Re-enable Survival Mode. Added Nuka World -> Game Alterations -> Unlock All Robot Parts. Added Game Alterations -> World Manipulation -> Teleport Merchants. Fixed Spawn Ghoul settler not working properly. Added Items -> Armor -> Power -> Spawn Power Armor Frame. Fixed DLC/Mod not being checked after the initial load. Added Player Manipulation -> Animation Speed. Added Config -> Game Alterations -> World Manipulation Position Units. Added Show All Map Markers to DLC Game Alterations menu. Added Game Alterations -> Workshop Manipulation -> Spawn Settler -> Spawn Ghoul Settler. Added 26 more custom markers for Move To Location -> Custom. Added Mods -> M1 Garand. Fixed Change Movement Speed's Current Value: 0.25x not working when the player used Set to: 0.25x. Refactored the way the Cheat Terminal determines when to check DLC and mods to be more efficient. Fixed Mods not showing if the user only has FACTOR - Modular Rifle installed. Fixed Instantly Unlock Terminals not awarding the player XP or firing the companion action. Added Mods -> FACTOR - Modular Rifle. Added Swan to Spawn NPC. Added more Spawn NPC effects. Added configuration to allow the user to set an effect for when the NPC leaves. Fixed Remove All Luck Perks not calling the new Remove Bloody Mess code. Added Game Alterations -> World Manipulation -> Position -> Z Location. Reordered Mods -> G36 Complex -> Mods to match the order in the bench. Renamed Mods -> G36 Complex -> Mods -> Silencer to Muzzle. Added Red Death to Far Harbor -> Spawn NPC. Added Mods -> G36 Complex. Added missing Nuka World Custom weapons Splattercannon and Throatslicer. Added an Activate call to Unlock Nearest Door, to attempt to open the door for the user, if the activation point is unreachable by the player. Added Nuka World -> Game Alterations -> Skip Home Sweet Home Quest. Added Nuka World -> Game Alterations -> Refill all 'Gang's Tribute Stash' Chests. Fixed Downloadable Content -> Vault-Tec Workshop -> Change Experiment To Build -> Phoropter -> Quest Mode not working. Fixed Downloadable Content -> Vault-Tec Workshop -> Change Experiment To Build -> Soda Machine -> Regular Caffeination displaying as Lost Revenue. Removed unused Items -> Mods terminal fragment that did nothing but error out silently to the Papyrus logs. Added Automatic to Items -> Mods -> Weapons -> Custom -> Automatic. Added Downloadable Content -> Nuka World -> Game Alterations -> Enable Broadsider To Work For All Arcade Games. Added Downloadable Content -> Vault-Tec Workshop -> Change Experiment To Build -> Item -> Quest Mode. Fixed Infinite Power Armor Battery not working after the user ejected their fusion core as a grenade. Fixed Items -> Apparel -> Pre-War -> Suits -> Tuxedo not working. Moved "mods" from DLC menu in to a Mods menu. The DLC checks are now done as an initial script check when the player pulls up their Pip Boy each time, or uses the Cheat Terminal. Downloadable Content will not show if the user doesn't own any DLC. This applies to the Mod menu, too. Fixed instances of Companion Teleport not working properly. Made the player look at 9mm/Wattz/Assault Carbine/Cappy locations item of interest when using Move to Location that was for a specific thing in the world. Added Move to Location -> (DEBUG) -> CTEST. Fixed Enable Raider Workshop Items causing Old Guns and The Molecular Level quests to be impossible to complete. Added Downloadable Content -> Alien Assault Rifle. Added Downloadable Content -> Wattz Laser Gun. Fixed Remove All Items not unequipped the player's weapon first, and causing the animations to break. Redesigned (DEBUG) menus to use the same method that the other menus in Move to Location use. Added missing zUnused locations to Move to Location -> (DEBUG). Moved Leave Debug Rooms from the bottom of the (DEBUG) menus to the top, once it's applicable. Fixed a scenario when the user would teleport to a (DEBUG) room, then using Move to Location to get out, and having the original location marker still be at the old original location if the user then went back to a (DEBUG) location. Moved Downloadable Content -> Automaton -> Move to Location -> (DEBUG Cell) in to a sub-menu that's similar to other (DEBUG) menus. Added Downloadable Content -> Nuka World -> Move to Location -> (DEBUG). Added DLC -> Far Harbor -> Items -> Quest, and merged Give All DiMA Memories in to this menu. Added Dismiss Custom Follower to Spawn NPC, due to users not readily finding it in Game Alterations -> Companion Manipulation -> Custom Companions -> Dismiss Follower. Fixed SpawnNPC Grenade spawning enemies with their factions. Fixed Automatron -> Game Alterations -> Teleport Ada not working. Fixed a bug with Fighter Grenades, which caused the user to have to select the grenade several times after throwing one to unequip it. Fixed a bug with Fighters/Temp NPCs/Custom Companions, where by shooting them would cause that NPC's faction to hate you. Added 10,000 base health to Fighters/Temp NPCs/Custom Companions, to prevent them from going down in one hit. Fixed Far Harbor Fighter Grenades all showing up as Spawn Robobrain Fighter. Fixed Infinite Power Armor Battery making a beeping noise when entering power armor, or loading a save while already in power armor. Fixed Game Alterations -> Player Manipulation -> Heal Player not refilling the player's health, if that health was occupied by radiation damage. Added No Muzzle option to all the Muzzle mod menus that were missing it. Fixed Items -> Mods -> Weapons -> Guns -> Combat Shotgun -> Muzzle not working. Conglomerated Items -> Mods -> Armor -> DCGuard -> Torso in to Items -> Mods -> Armor -> DCGuard. Conglomerated Items -> Weapons -> Guns -> Shotguns -> Combat Shotgun, into Items -> Weapons -> Guns -> Shotguns. Fixed No Recoil/Rapid Fire not working on Combat Shotgun. Fixed Items -> Weapons -> Heavy not showing a display screen after choosing items that would pop-up immediately. Added gir489's Army M16A4 to Assault Carbine -> Weapons, and Chinese Assault Rifle to Nuka World -> Weapons -> Custom. Separated out Nuka World -> Spawn NPC -> Set Spawn NPC Grenade's NPC by category, and added Nukalurks. Fixed Purge Container 1 not removing an item if it was part of the Cheat Terminal quest. Added Downloadable Content -> Assault Carbine. Fixed Game Alterations -> Levels and Perk Points not refreshing the terminal after make a selection. Added Game Alterations -> Reputation back in, due to popular to demand. Added Items -> Armor -> Unique. Moved Grognak Costume from Items -> Apparel -> Wasteland -> Other to Outfits, and made it follow proper spawning procedure. Added Items -> Apparel -> Gloves. (Which is a reimplementation of Gloves of the Commonwealth). Removed Game Alterations -> Reputation because it had no effect. Refactored Female Companion to be more like the Male Companion. Added Game Alterations -> Companion Manipulation -> Force Companion out of Power Armor. Fixed a bug with Godmode that caused the force from explosions to hurt the player. Reverted the way Cheat Terminal was finding workshop locations to a previous method that worked for DLC workshops. Fixed DLC -> Nuka World -> Items -> Mods -> Armor -> Operators/Pack taking you to the wrong sub menus. Renamed Items -> Mods -> Armor -> Railroad -> Railroad to Ballistic Weave. Fixed user reported issue (yakalrad | X-111 and Nuka-Nuka Schematics are missing. Fixed Items -> Mods -> Weapons -> Energy -> Institute Laser Rifle -> Sights using the Laser Rifle's page. Added Items -> Mods -> Weapons -> Other -> Broadsider. Refactored the way Workshop Manipulation attempts to find workshops at the player's current location. This submenu will now only display pertinent options depending on if the player has a companion or not. Fixed Change Companion Appearance sometimes complaining about power armor when the companion wasn't in power armor. Added Stop Companion Attacking You. 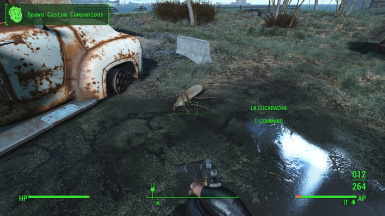 Added a script to La Cucaracha to prevent him from attacking you, and increased his base health to 400 from 50. 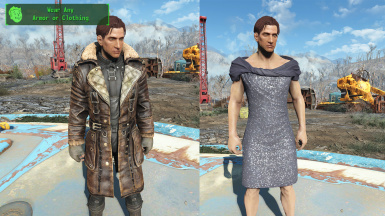 Refactored Male/Female Companions to work with Change Companion Appearance. Spawning a custom companion now refreshes the terminal instead of bringing you back to the main menu. Enabled the console for PC users while in survival mode. Added Game Alterations -> Workshop Manipulation -> Delete/Store Current Items In Current Workshop. Refactored Game Alterations -> Player Manipulation -> Change Appearance automatically handle the camera changes for the user. Renamed Game Alterations -> Companion to Companion Manipulation. Conglomerated Spawn X and dismiss custom companion in to a separate sub menu called Custom Companions. Added Synth Companion/Random Male Companion/Random Female Companion. Added Items -> Apparel -> Dog and Super Mutant. Fixed an issue with Game Alterations -> Reputation, where setting the Faction to Enemy wouldn't cause them to attack the player. Added Game Alterations -> Player Manipulation -> Change Pacify Chance. Added Game Alterations -> World Manipulation -> Mysterious Stranger Chance. Conglomerated Game Alterations -> Weather Manipulation and Timescale in to Game Alterations -> World Manipulation. Added World Manipulation -> Date and Time and Position. Added Remove All Perks option to each Perk menu. Added Game Alterations -> Player Manipulation -> Change Carry Weight. Added Game Alterations -> Reputation. Refactored how the Cheat Terminal spawns custom weapons to match how the game does it. Added missing custom weapons and armor to Far Harbor and Nuka World. Added checks to Downloadable Content, to only show the submenus for DLCs the player is currently running. Added Lorenzo's Crown to Items -> Apparel -> Wasteland -> Outfits. Moved Items -> Apparel -> Wasteland -> Sports to Pre-War -> Sports. Added Items and Equipment -> Remove All Items From Player. Added a notice to Game Alterations -> Request Save to tell the player to close the Pip-Boy, so they know it will save once the Pip-Boy is closed. Moved Cheats -> Gameplay -> Player's Power Armor Never Breaks to Gameplay Alterations -> Player Manipulation. Removed Game Alterations -> Timescale -> Set to: 1 real minute = 0 Fallout minutes, because it caused too many problems. Added Cheats -> Gameplay -> No Time Elapsed From Fast Travel. Added 0.75x/0.5x/0.25x speeds to Game Alterations -> Player Manipulation -> Player Speed. Added Game Alterations -> Companion -> Height Manipulation and Speed Manipulation. Fixed Custom Companions being rotated when spawned. Added Game Alterations -> Timescale. Added Game Alterations -> Player Manipulation -> Change Height. Added Game Alterations -> Player Manipulation -> Change Movement Speed. Added Game Alterations -> Workshop Manipulation -> Spawn Settlers -> Spawn Brahmin. Added 9mm pistol items to The Merchant supply. Added Game Alterations -> Workshop Manipulation -> Add Crafting Material Directly to Workshop. Added Game Alterations -> Unlock Nearest. Relabeled Configuration -> Overload SPECIAL attributes to Enforce Level 11 SPECIAL Cap, and fixed it displaying the values backwards. Fixed spawning certain workshop items not working, and added checks to items like the Trade Post and Tribute Chest to only spawn if the user is within a workshop to attach to, since they require Workshops. Redesigned Set Workshop Happiness to 100 and Enable All Raider Workshop Items to be a submenu, so that it can include an "apply to all" option as well. Added Game Alterations -> Workshop Manipulation -> Repair Workshop Items. Fixed Enable all Raider workshop items at current workshop causing the workshop's icon on the map to change to the Raider icon. Implemented Workshop Alterations for Nuka World. Added Nuka World -> Game Alterations -> Workshop Manipulation -> Spawn Tribute Chest. Refactored Move To Location/Spawn Settler/Spawn Workshop Item functions to all use the same script to fix regression issues. Fixed misspelling of Phoropter in Vault-Tec Workshop -> Change Experiment To Build. Fixed Move to Location -> Commonwealth -> UFO Crash Site not working after the UFO crashes. Added Far Harbor -> Spawn Far Harbor Settler. Added Game Alterations -> Workshop Manipulation -> Spawn Trade Caravan Post. Added Nuka World -> Game Alterations -> Enable all Raider workshop items at current workshop. Added Game Alterations -> Workshop Manipulation. Moved Game Alterations -> Spawn Settler to Game Alterations -> Workshop Manipulation -> Spawn Settler. Moved Game Alterations -> Spawn Workbenches to Game Alterations -> Workshop Manipulation -> Spawn Workbenches. Moved Game Alterations -> Teleport to Move to Location -> Custom. Relabeled Edit Character Attributes to Player Manipulation. Moved Heal Player to Player Manipulation. 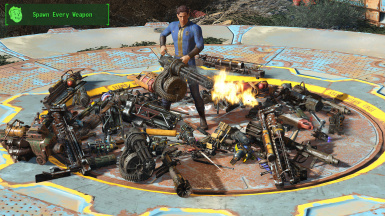 Changed Build Vault Stuff Anywhere to Unlock All Vault-Tec Workshop Items. Swapped the position of Fusion Cell and Fusion Cores in Items -> Ammo -> Energy. Added Game Alterations -> Item Manipulation -> Add Item to Quest. Fixed Nuka World -> Items -> Misc not respecting the configured amount to give. Moved Nuka World -> Items -> Unused Grandchester Mansion Ticket to Quest. Fixed Far Harbor -> Items -> Junk not working, and add some missing items. Added missing item Curie's Healthpak to Items -> Aid -> Health. Compartmentalized Game Alterations -> Change Character and Change Name to Game Alterations -> Change Character Attributes. Added Game Alterations -> Item Manipulation. Added Game Alterations -> Companion -> SPECIAL. Added 50 to Config -> Items -> Amount of aid items to give. Adjusted some menu positions in Downloadable Content to match the main game. Moved and fixed Nuka World -> Items -> Misc -> Medallions to Nuka World -> Items -> Misc -> Quest -> Medallions. Added Nuka World -> Game Alterations -> Force Open Bradberton's Security Door. Added Game Alterations -> Companion -> Teleport. Fixed various spelling mistakes in the menu. Fixed Orange/Yellow Institute Division Head Labcoat, Yellow Institute Labcoat not working. Fixed some of The Merchant's DLC items not working. Fixed SPECIALs and Perks -> SPECIAL not setting the appropriate perk for the game to properly track how many points the user had added/removed. Added SPECIALs and Perks -> SPECIAL -> Set SPECIAL to 1. Added DLC items to The Merchant. Changed Add All Robot/Nuka Soda/Project Cobalt Craftables verbiage to use Unlocks. Added missing Automatron Item Mods. Moved Configuration -> Cheats -> Set Perk Points/Levels to Configuration -> Gameplay. Moved Game Alterations -> Show All Map Markers and Add All Map Markers to a submenu called Map Markers. Moved Game Alterations -> Companion -> Companion's Power Armor Never Breaks and Companion Essential to Companion Cheats. Redesigned the menu to look more consistent with Nuka World and Far Harbor. Fixed Robot Repair Kit not respecting the configured number of Aid to add. Added Far Harbor -> Game Alterations -> Add All Craftable/Workshop Unlocks. Added Nuka World -> Game Alterations -> Add All Robot/Nuka Soda/Project Cobalt Craftables. Fixed Far Harbor -> Items -> Mods -> Marine -> Torso -> Lining not working. Added Cheats -> Gameplay -> Player Essential. Added a configuration entry to Config -> Items -> Amount of crafting items to give to allow the user to set the position for ADD EVERY COMPONENT. Added Far Harbor -> Items -> Keys. Finished Nuka World -> Items -> Mods -> Weapons. Added Game Alterations -> Change Name. Added Far Harbor -> Give All DiMA Memories. Added Far Harbor -> Items -> Mods. Added Far Harbor -> Items -> Islander's Almanac. Added Nuka World -> Items -> Mods -> Armor. Added a basic version of The Merchant. Fixed Always Crit critting friendlies. Refactored MoveToLocation to properly allow re-selecting if coming from a Nuka World location selection. Added missing item Food Paste to Aid -> Other. Fixed spawn settlers in Nuka World displaying the wrong text when selecting an item. Finished refactoring Items -> Mods. Added Companion Cheats -> Infinite Carry Weight. Fixed Game Alterations -> Edit Character breaking if the player was holding a weapon when activating it. Added Nuka World -> Game Alterations -> Spawn Settler. Moved 2mm ECs from Energy to Guns. Renamed Items -> Aid -> Drinks -> Nuka Cola to Nuka Colas to imply it's a submenu. Fixed Items and Equipment -> Misc -> Bobbleheads not working properly. Fixed Infinite Items replenishing the item if the player was moving the item to a container. Added Nuka World -> Items -> Misc -> SCAV! Changed the Spawn Settler dialog box to a message box, so the user can have more time to read it thoroughly. Added Nuka World -> Move to Location -> Cappy Locations. Added Nuka World -> Items -> Mods -> Armor -> Power -> Overboss. Added Nuka World -> Game Alterations -> Companions -> Add Gatorclaw Companion. Added Items -> Mods -> Armor -> Power -> Raider. Removed Move to Location -> Interiors. Added Game Alterations -> Companion -> Companion Cheats -> Infinite Ammo. Added Game Alterations -> Companion -> Set Essential. Added Cheats -> Inventory -> Infinite Items. Fixed Enable/Disable Companion's Power Armor Never Breaks both showing at the same time, and not articulating the status to the player if their companion had it or not. Finished Nuka World -> Perks. Added Nuka World -> Perks. Added Move to Location -> Interiors. Added Cheats -> Gameplay -> Infinite Power Armor Battery. Fixed La Cucaracha sometimes becoming hostile. Fixed Dismiss Custom Companion not properly marking the old companion for deletion. Fixed various Power Armor Right Legs being displayed in the menu as "Right Left." Removed 99999 Armor Rating Boost. Replaced Heal Player for 0.01 damage every time the Get Damage To Player function was called, with an OnHit event that's done through a Quest, to prevent Papyrus and over-healing the player. Made the player's power armor immune to damage when the player has Godmode on. Added Items -> Mods -> Armor -> Power -> X-01. Added Game Alterations -> Companion -> Companion's Power Armor Never Breaks. Game Alterations -> Spawn Nuka-Mixer Station. Refactored the Cheat Terminal Portable quest message to display properly when starting a new game. Refactored Items -> Misc -> Bobbleheads to give the user the actual world Bobblehead, so that it will activate the perk, and not create duplicates. Refactored Nuka World -> Items -> Misc -> Recipes to actually work, and added an Add All Recipes option. Refactored Nuka World -> Items -> Misc -> Unused -> Project Cobalt Schematics in to Items -> Misc -> Quest -> Project Cobalt Schematics. Readded Nuka World -> Items -> Ammo -> Weaponized Nuka Cola. Added Wolverine1821's reported missing items: Vault-Tec Salesman Coat, Vault-Tec Salesman Hat, Minuteman Outfit, Sweater Vest & Slacks, Sequin Dress, Red Dress, T-Shirt and Slacks, and Rum. 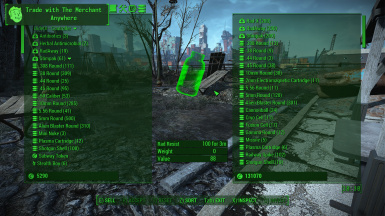 Fixed Nuka World -> Items -> Misc -> Quest -> Nuka Cola Formula giving multiple copies if the user clicked it multiple times. Refactored the Cheat Terminal Portable quest to display a message when the user successfully installs the mod, to instruct them how to use it. Added Gage to Game Alterations -> Companion -> Unlock Next Companion Dialog. Removed unused Weaponized Nuka Cola ammo from Nuka World Ammo. Fixed terminals displaying Give Portable Cheat Terminal if you inserted the portable terminal in to the terminal. Sea Captain's Hat Patrolman Sunglasses Road Goggles Wraparound Goggles McCready's Hat Red Leather Trench Coat Press Cap Red Frock Coat Tricorn Hat Vault-Tec Lab Coat Militia Hat Raider Leathers Sack Hood, + with Hoses, + with Straps Postman Uniform Postman Hat Rex's Suit Reginald's Suit Surgical Mask Red "" Leopard Print "" Jangles "" Stars and Stripes "" Stripes "" Skull ""
Added Mirelurk Egg to Aid -> Meat -> Mirelurk. Fixed Far Harbor -> Items and Equipment -> Weapons -> Mines not respecting the configurable throwables amount. Fixed Weapons -> Explosives -> Thrown displaying Added 10 instead of just Added. 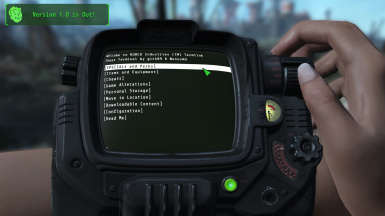 Fixed Move to Location asking you to close the pipboy if you were coming from the Cheat Terminal. Flushed out the locations in to more submenus. Fixed some submenus not respecting the Pipboy close menu. Fixed some random entries not taking you to the right place. Moved Vault 111 to R-Z. Moved from XMarkerRef to MapMarker, to allow the game to dynamically move the MapMarker. Added Downloadable Content -> Far Harbor -> Game Alterations -> Enable All Map Markers. Added Add All X Perks function to each submenu of Perks. 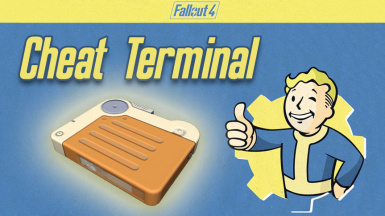 Refactored the Portable Terminal quest to check for the pipboy menu opening to give the Portable Terminal instead of MQ102. Added a craftable version of the Cheat Terminal to workshops under Power -> Other -> Cheat Terminal. Fixed Game Alterations -> Companion -> Unlock Next Companion Dialog not working right. Refactored Game Alterations -> Companions -> Max Companion Affinity to Unlock Next Companion Dialog. Added SPECIALs and Perks -> Perks. Changed Portable Storage Pipboy Close Method to default to Method 1. Refactored the Cheat Terminal to be placed by a quest, so the mod no longer holds SanctuaryExt hostage. Added Configuration -> Cheat Terminal, to allow the user to disable the Cheat Terminal in Sanctuary, if they don't like it. Moved Read Me configuration to its own sub-menu in Configuration, and added an explanation for it. Fixed Game Alterations -> Weather Manipulation calling ResetHealthAndLimbs on the player. Fixed Game Alterations -> Companions -> Max Companion Affinity not sending an event to the companion script to update the companion's dialog, and start their quest. Refactored Move to Location and anything that tries to close the pipboy for you in to two configurable modes. Fixed Game Alterations -> Teleportation calling ShowAllMapMarkers. Fixed Easy City Downs, Fallen Skybridge, USS Constitution not working or showing on the map with Enable All Map Markers. Fixed traps hurting the player when they had Godmode on. Fixed Move to Location not bringing your companion with you. Refactored Game Alterations -> Custom Companions in to Companion. Added Companion -> Max Current Companion Relationship. Added missing Diamond City, Diamond City Market, and Home Plate locations to Boston. Added Game Manipulation -> Show All Map Markers. Fixed Move to Location -> Commonwealth -> S not working. Refactored Cheats subentries to not contain the word cheats, because it was redundant. Added Cheats -> Gameplay -> Instantly Unlock Terminals. Fixed user reported issue (VotiveTrain8673 | Yao Guai meat is missing from Aid). Fixed user reported issue (Blu3s420 | Cheat Terminal in Sanctuary causes problems with the Workshop). Refactored Cheat Terminal Portable quest to check MQ102 stage 6, instead of completed, replacing the has pipboy check, which wasn't reliable. Moved the Cheat Terminal from QASmoke to Sanctuary. Added Give portable terminal, that will only show on the Cheat Terminal if the player is missing the portable terminal. Fixed Explosives -> Launched -> Explosive MIRV showing as Added Big Boy in the terminal text. Made Game Alterations -> Spawn Workbenches configurable, so the user can choose if they want it there permanently or let the game delete it when it can. Added Move to Location -> Boston. Fixed Game Alteration -> Heal Player not removing Rads properly. Adjusted the Portable Cheat Terminal quest to be the highest priority, and refactored the script to check if the player has the Pipboy instead of MQ102 being after the pipboy stage. Fixed Infinite Grenades showing as Infinite Ammo in pipboy. Added Items -> Mods -> Weapons -> Custom. Moved Custom to to Game Alterations -> Teleportation. Fixed Far Harbor Debug locations not using the Leave Debug Room feature. Finished implementation of Mods -> Weapons. Fixed Ammo Config Set to 50 not working. Fixed Ammo not displaying the proper response string. 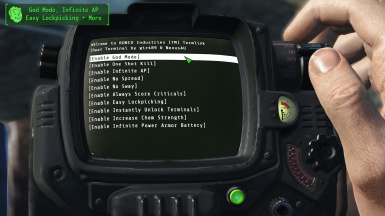 Refactored Power Armor to have submenus for each Power Armor set, to allow the user to give themselves pieces of the armor, or spawn it. Implemented Items and Equipment -> Apparel. Added 999999 armor rating back to Godmode. Readded Armor Rating set to 99999. Enemies no longer run from you. Added tracker waypoint for Debug cells. Added Sanctuary and Sanctuary (Pre-War) locations. Added X01 Power Armor to Armor -> Power. Moved Items and Equipment -> Apparel -> Armor to Items and Equipment -> Armor. Fixed Hunting Rifle giving Short Hunting Rifle. Refactored Godmode to not set Armor Rating to 99999, but instead, 0 out incoming crits. Fixed Cheat Terminal Quest not giving the player the terminal immediately after starting the game, if MQ102 was in progress. File 'Cheat Terminal Alpha 33' changed to 'Cheat Terminal - Alpha 33'. File 'Cheat Terminal -Alpha 45' changed to 'Cheat Terminal - Alpha 45'.